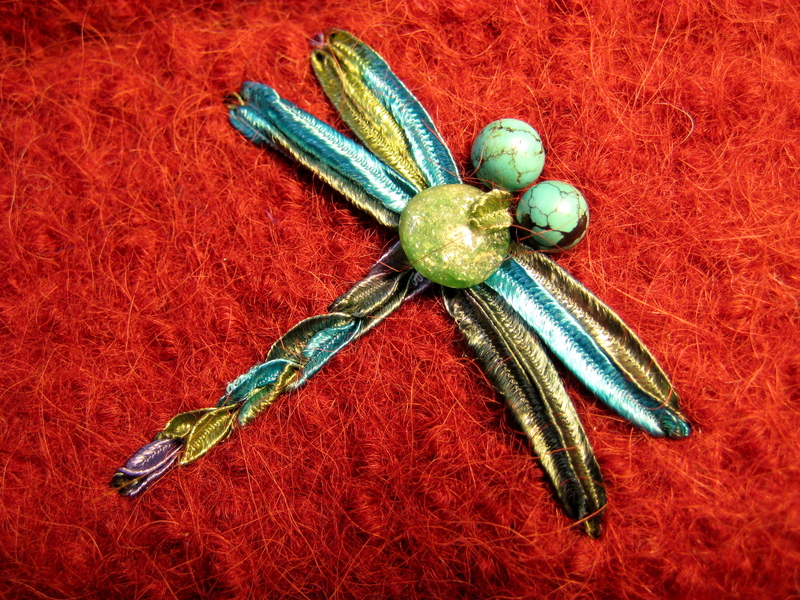 This entry was posted in Embroidery, Fine Craft, Hat of the Week and tagged beads, dragonfly, Fine Craft, jade, new, turquoise by Carrie Cahill Mulligan. Bookmark the permalink. Simply breathtaking! It would be amazing if you were able to create brooches using this design. . .
WOW !!! that is awsome!!! Ooh, thanks so much for the positive feedback! I’ve just finished my 2nd dragonfly: it’s the reverse = red on green, and I’ll be donating it to the NHPTV Online Auction shortly… stay tuned for info on how to bid! I absolutely LOVE my dragonfly! I am SO honore that I am the 1st of many. I have already been stopped by many dragonfly lovers in my tracks! I am still promoting your amazing hats and will never stop! You are the BEST, Katie! Thank you. Rock that dragonfly!